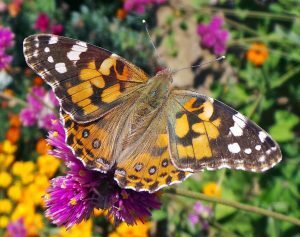 The adult painted lady has orange and brown patterned wings with white spots near the tips of the forewings. The painted lady (Vanessa cardui) is the most widespread of all butterflies in the world. It is found throughout Europe, Asia, Africa, North America, and Central America. Although not a permanent resident here in Wisconsin (it can only survive very mild winters here), it is a common visitor to the garden, especially in the fall. In most years the painted lady moves north out of the deserts of northern Mexico and the southwestern U.S. to temporarily colonize the United States and Canada south of the Arctic. The first adults usually arrive in June to begin egg-laying. Periodically, enormous migrations from these deserts inundate other areas of the country, so it can be locally very abundant at times. There are four small spots on the underside of the wings. The upper side of the 2-2½” wings are pinkish-orange with thick black lines and white spots near the tips of the forewings. The underside is a pattern of black, brown, red-orange and gray with four small spots near the margins. Females are generally larger than males. 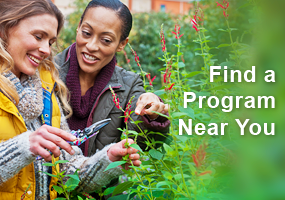 The adults like open areas, such as prairies, old fields, vacant lots, and gardens. They prefer to feed from tall (3-6 feet high) plants, including blazing star, cosmos, New England aster, Joe-pye weed, Mexican sunflower, purple coneflower, and zinnias. They will visit other nectar plants, though, including red clover and milkweed. The adults only live for about 2 weeks, feeding exclusively on nectar. Males perch and patrol during the afternoon for females that are ready to mate. 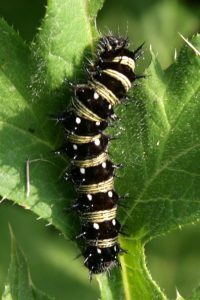 A caterpillar of the related American (V. virginiensis) on Echinops ritro. The female butterflies lay pale green eggs the size of a pin head singly on leaves of many different food plants. The spiny caterpillars, which hatch after 3 to 5 days, are grayish brown or purple-black with yellow side stripes. They feed on the leaves of a wide variety of host plants (more than 100 species have been recorded) primarily in the families Compositae, Boraginaceae, and Malvaceae. Some of their preferred foods include calendula, hollyhock, mallow, sunflower and thistles (including Canada thistle). They eat continually for 5 to 10 days while living in a loosely woven silk nest, and, if numerous, can completely defoliate a plant. They go through 5 instars as they grow to an ultimate size of about 1¼ inches, before pupating on the host plant. The caterpillar hangs upside-down, attached with a single silken string, and forms a naked chrysalis from which the adult butterfly will emerge 7 to 10 days later. The number of generations per year vary from year to year, but is generally two in our area. This species overwinters as adults, but rarely survives the harsh winters in the Midwest. Painted lady egg (L and LC), young larva (C), last instar larva (RC) and pupa (R). All images from Wikipedia. 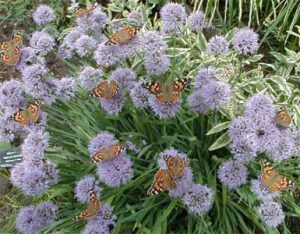 A mass of butterflies on a flowering Allium. These butterflies can be attracted by planting flowers they like, providing shallow water or draining wet sand and keeping the area pesticide-free. Some other garden nectar plants they will visit (in addition to those mentioned above) include butterfly bush (Buddleia), heliotrope, anise hyssop, marigolds, scabiosa, sedums, sweet William and Verbena bonariensis. Other common, closely-related species, which are actually more abundant in Wisconsin in most years, include the red admiral (V. atalanta) and American lady (V. virginiensis). They can be distinguished from the painted lady by the patterns on the upper and lower wing surfaces. Red admirals have distinct red bands, while the American lady has thinner black lines on the upper wing surface and two larger spots on the underside. Other common butterflies closely related to painted lady include the red admiral (upper wing surfaces L, underside LC) and American lady (upper RC, underside R). Great article on butterflies. 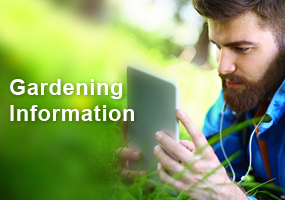 I plan on using some of the information to improve my garden to help attract more butterflies! Very interesting article. My wife and I raise Monarchs and so much attention is drawn to them. Nice to see the interest in other butterflies as well. Interesting that they hang in a naked chrysalis. Will keep an eye out for these. 2018 was my introductory year for planting butterfly & bee gardens. I was thrilled to see many of the seeds / plants I used were on the list for the painted lady. Fingers crossed many of my plants survive and return in 2019; however, the tall field grass may have its way with the area so more research on the best time to cut these areas down this spring is needed. I have seen these butterflies before but did not know what they were. I will pay more attention in the future. I’m always looking for the caterpillars. Now I know what that the black ones will become something beautiful. Love seeing so many in my gardens also. I have tons of photos. I thoroughly enjoy watching the different butterflies come through my gardens! This one is one of my favorites. Interesting to learn theses beauties prefer tall flowers to regenerate. Interesting article. I have seen this butterfly many times in my gardens, I do have butterfly bush, anise hyssop, marigolds,and Verbena, growing in my upper garden, I was surprised to see that they like marigolds of which I had planted many to keep out the deer and other wildlife away. Thank you for this interesting article. I spotted the painted lady and red admiral butterflies on my butterfly bushes as late as 2 weeks ago and was astonished they were still around! Any thoughts as to why the migration of Painted Lady butterflies to Wisconsin was so late in 2018 (compared to previous 13 years)? They didn’t start showing up (confirmed sighting) until the very end of August this year. Of the very few earlier publicly submitted sightings (not photographed) this year, those were quite possibly misidentifications of the American Lady. I have seen the Painted Lady Butterflies in my yard. I found it interesting that they prefer to feed from tall plants. I also found it interesting that they like marigolds and allium. Read for MG ed. This article was nice to read because I have seen this butterfly around the garden before. I actually thought they were pretty common. I didn’t realize they were so wide spread throughout the world. I will keep my eye out for the caterpillars, but I currently only have cone flowers which they enjoy. Just wondering if this butterfly is threatened at all like the monarch? This was a very informative article. Another reason to stop and look closer at some of the plants in my perennial garden. While I do butterfly watching, my dog loves to go butterfly chasing. It’s interesting to read about the different host plants that are used by different varieties of butterflies. I have seen the “look-a-likes” of this beautiful butterfly and will keep an eye out for the real deal. Looking at the caterpillar, the final instar and the mature butterfly of this species makes me marvel at the incredible beauty and design we find in nature. I too have overlooked this beautiful butterfly, assuming they were a monarch. Thanks for all the identification pix and info. I have a lot of the plants in my gardens that they feed on and will certainly pay more attention! I didn’t see any larvae in my garden this year. I loved this article. Painted lady butterflies are one of my favorites! Thanks for posting. Very interesting to learn how to identify this butterfly and the habitat ideas. Although I know quite a bit about monarchs as have worked for their conservation for over 15 years, I did not know as much about painted ladies. This is an informative article that will help me to explain the difference to the school children I work with. Does the term naked pupa as referred to in the article only mean that you can see through it. Through all my reading, I have never encountered that term before. What beautiful butterflies! Thank you for the article. Wow another article with information that has been totally off my radar. A whole flock of them on chives blossoms. I have rather a lot of chives so I will watch for them in spring. Thank you for the information. Would love to see some of these beauties in my garden soon! I will have to be sure to plant more butterfly friendly plants in the future. Read for edu hours. I had a bumper crop of these beauties last year. They were all over my Salvia azurea and Monarda puntata. This year, I have not seen any. I, too, was surprised by the fact that they are the most widespread of all butterflies in the world. The fact that they have over 100 species of host plants is probably part of the reason they are so abundant worldwide. This is in direct contrast to the Karner blue butterfly which has one host plant (Lupinus perennis) and is on the Federal Endangered Species List. Greate Article. I have planted a butterfly garden with hopes to attract many butterflies. I was surprised to learn that this is the most common butterfly in the world. The info and pictures showing the differences between this and the American Lady will be helpful in differentiating the species. I love the painted lady but didn’t know they go South. Yearly I visit CO & NM at Xmas and will be looking for them. I am working on a book for Master Gardeners that focuses on insect mouthparts. I am always looking for information especially on what different insects eat. This article was very helpful in identifying what the adults eat (exclusively nectar), whereas the caterpillars feed on numerous plants (listed in article). Thanks Susan Mahr, very helpful article. I love to see all the butterflies that come through, especially when they are on the sedum and joe bye weed. I didn’t know much about all the different “ladies” but I’ll definitely be keeping an eye out for them. Thank you. I think from a distance some people mistake the painted lady for a monarch. 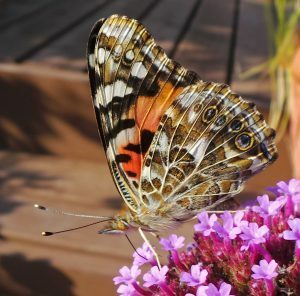 I am glad to hear we have flowers in our garden that are favorites of the painted lady. Great article. Will help me identify this butterfly in my garden. Surprised to learn that the “Painted Lady” is also known as the “Thistle Butterfly” because of their food preference. Was just talking yesterday with some other gardeners about how to ID painted lady, the photos help with distinguishing these from red admiral and American lady. The phrase “naked chrysalis” is new to me, so I had to double check that – all the more amazing that these little guys survive their transformation. I’ll keep my “eyes out” for this beauty. It’ll be a challenge to identify the eggs that the female lays. I found the photos of the various stages of development easy to understand with the explanations provided. A very informative article that will be great resource in identifying butterflies visiting our gardens. Nice to learn more about the large number of plants the Painted Lady, Red Admiral and American lady use for their habitat, this will be helpful when making selections for next year’s flower beds. Beautiful pictures! Good information. I’ve enjoyed seeing these beauties in the flower gardens. I have seen them in my yard although I’m in a more wooded area. Beautiful! Interesting article. I always thought this was a moth – one of the pretty ones. Interesting article! Good to know some different plants to grow to attract butterflies. I didn’t realize it was the most widespread butterfly in the world. I see it often in my chives. Was surprised to read it’s the most plentiful butterfly in the world! Very good article! I have a lot of the red admiral but only spot the occasional painted lady in my yards. I may have to plant some different flowers to attract the painted lady. Unfortunately, I often find just wings and not the butterflies. They tend to like to cling to my garage doors at night, attracted to the light and the birds like to feast on them come morning before their wings dry off and they can fly away. It is sad. But the cycle of life. 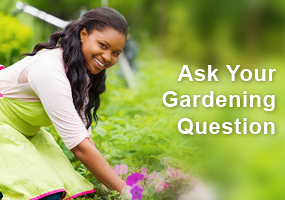 Helpful article for planning a flower garden next year. More butterflies the better. Thanks for helping us learn more about butterflies. I raised some monarchs this summer, but my knowledge of other kinds of caterpillars and butterflies is scant. The painted lady caterpillars aren’t awfully appealing. Learning about butterflies can motivate us to grow and take care of more nectar flowers. Thank you for providing the article. As different butterflies are flitting around, it’s a challenge to see their unique markings. There are so many similarities. It’s a challenge to learn the colors, the stripes, the spots, etc. The richness of the colors of these “ladies” are so enjoyable. It will be fun to be able to identify those that I come across. I have quite a lot of butterflies in my flower beds this year. It’s good to be able to put a name to them now. Also good to know that I have a lot of the flowers that they like.